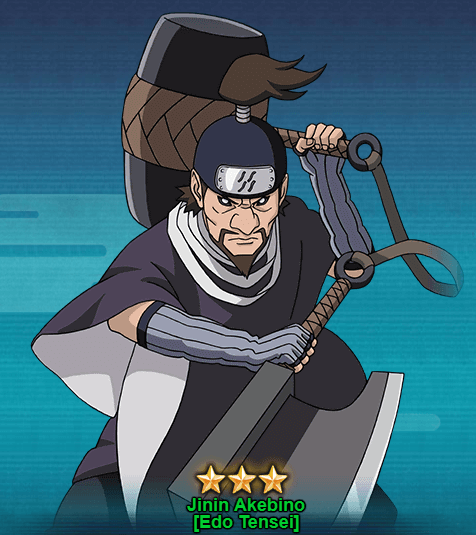 Jinen Akebino [Edo Tensei] is a member of the Seven Ninja Swordsmen of the Mist who wields Kabutowari, which consist of a giant axe and hammer. Like other members of Seven Ninja Sowrdsmen, Jinen also love to kill enemies. Let’s move on to the overview and abilities of Jinen Akebino [Edo Tensei] in Naruto Online. Taijutsu & Ninjutsu Blunt Blade Ninja Art – Breakthrough [Prompt]: Causes damage to the selected opponent’s unit, Low Float and Tag. After using this skill, all this unit’s Technique Points will be down to 0. Taijutsu Blunt Blade Strike: Attacks the opponent’s units in the front row and will cancel all the affected unit’s Buffs and Shields. Moroever, this skill has a given chance of causing Knockdown. Taijutsu Blunt Blade – Stone Pieces: Chases and Attacks Knocked Down unit, causes Low Float. Moreover, this unit will get 1/2 Technique Point. If there are other Edo Tensei unit in your Lineup, this skill can be triggered 2 times every round. Taijustsu & Ninjutsu Blunt Blade – Fissure: Triggered with at least 20 COMBO, causes light damage to all opponent’s units in their Lineup. Moreover, this unit will get 1 Technique Point. Ninjutsu Blunt Blade Technique: At the beginning of a battle, this unit has a 0 Technique Points. A maximum of 4 Technique Points can be stacked up. The unit will have its Ninjutsu and Attack increase by 60% for every Technique Point stacked up. The only way to get Jinen Akebino [Edo Tensei] is from the GNW (Great Ninja War) Treasure. You will need to draw at least 60-120 scrolls to get Jinen Akebino . If you’re lucky you might draw him with lesser seal scrolls.